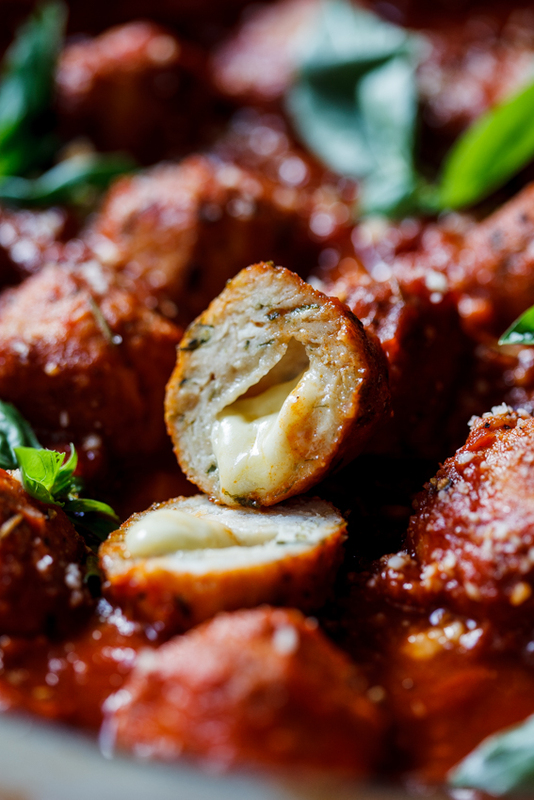 Delectable cheese-stuffed chicken meatballs cooked in rich, herby tomato sauce is dinner perfection. Served with pasta or crusty bread to mop up the sauce. As I type this I am knee-deep in recipe development/food styling/food photography mode for a new client. You guys, developing and shooting 50 recipes in two weeks is no joke. There is constantly new ingredients being shoved into my already-at-capacity fridge and freezer, we are doing 2/3 loads in the dishwasher every day and my feet haven’t ached this much since my days working in hair salons in my early 20’s. But we only have two more days and 10 recipes left so I’m staying positive. As you can imagine, the last thing I feel like doing after a day of cooking/shooting 6+ recipes is make dinner. But last week after serving my kids ham and cheese sandwiches one night and instant noodles the next (gasp! ), I knew I had to put something that requires more effort on the table. My kids (and I) LOVE meatballs. Which should come as no surprise to you since I have about eleventybillion meatball recipes on this blog. But I didn’t have any beef in the freezer so I decided to turn some chicken mince (ground chicken) into these delectable cheese-stuffed beauties. The cheese-stuffed part of these is completely optional (but is it?) which will make the assembly of this recipe a hell of a lot faster. But you guys know I’m all about that cheesiness so for me, it’s cheese all the way. I served this over al dente spaghetti but a good hunk of crusty bread to mop up all that herby tomato sauce will be just as good. Bon appetit! 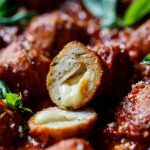 Delectable cheese-stuffed chicken meatballs cooked in rich, herby tomato sauce is dinner perfection. Serve with pasta or crusty bread to mop up the sauce. To make the meatballs, combine the chicken, parsley, chives, garlic, chilli flakes, egg yolk, breadcrumbs, salt and pepper in a bowl and mix well. With wet hands (this prevents the chicken from sticking to your hands), take tablespoons of chicken mix and add a cube of mozzarella to the center. Shape into meatballs. To make the sauce, saute the onion and garlic in a splash of olive oil until soft and translucent. Add the herbs and fry for another minute before adding the tomatoes, Balsamic, sugar, salt and pepper. Turn down the heat and allow to simmer for 10-15 minutes. To cook the meatballs, heat a large, non-stick frying pan over high heat and add a splash of oil. Fry the meatballs until golden brown and cooked through. 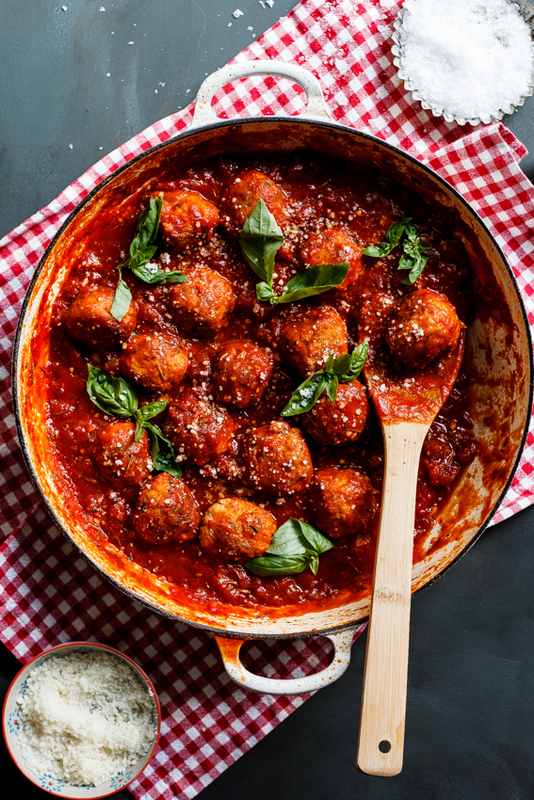 Transfer the meatballs to the tomato sauce and allow to cook gently for 10 minutes. Season to taste and serve topped with fresh basil and Parmesan. 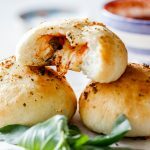 wow, I’m impressed that you were able to whip this up with all that you have going on, guess you’re in recipe production mode, thank you for this recipe, I love meatballs too and this is nicely different, love the cheese inside! Thanks Sabrina. 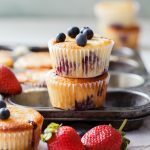 I was DEFINITELY in recipe production mode. 🙂 That cheese inside just pushes it over the top. So good! Thanks so much Laura. Cheese just makes everything better, doesn’t it? My kids are going to be ALL over these cheesy meatballs. They look great Alida. These meatballs look so good. Could I use any other cheese to stuff them with? 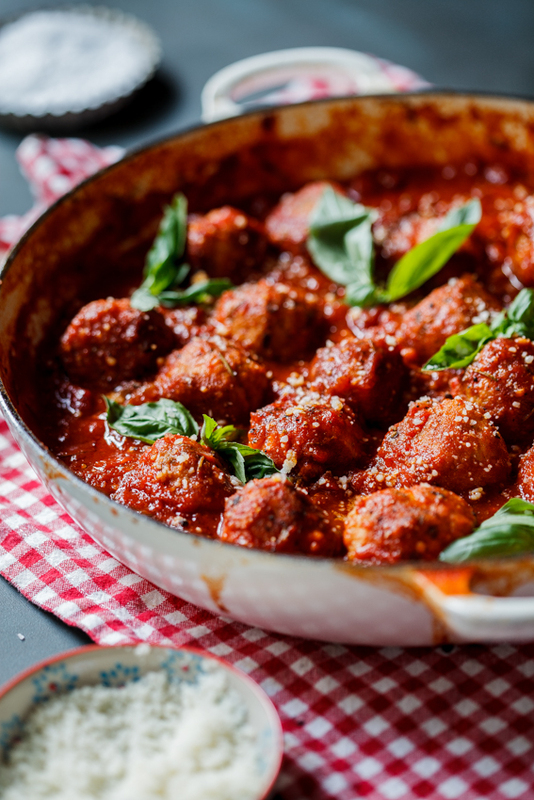 Oh my word, these meatballs look delish Alida!! Just saw your photo on IG and I’m hungry for dinner already! !